What is one of the best ways to combat getting older? By working out. Keeping your body in peak physical condition is one of the great ways to keep from not only looking old but also feeling old. One of the best methods to keep yourself feeling younger is by incorporating regular explosive, high-energy routines into your regular workout schedule. Plyometric workouts are all about explosive movements to build power, agility, and muscle. Doing a routine like this a few times a week can really help you get back some of that spring for your step. This can easily be done before or after a regular workout. Personally I like to do them as a warm-up before running or another cardio activity. This is a circuit that is designed to be done three times. Perform each exercise with no rest in between and then rest a minute between circuits. Focus on form at first until you get comfortable with the movements then start to work on speed and quickness. The Power Skate – Start in a standing position with your knees slightly bent and hands at your size. Jump to the left and land on your left foot. As you land your right leg kicks sideways behind you while you descend into a crouch. Your arms will swing to the side you are jumping and overall you should mimic what a speed-skater looks like. Repeat this motion going to the right for 1 rep. Do 10 reps total. Clap Jacks – These are like jumping jacks but instead of your arms going overhead you swing your arms together in front so your hands clap together. Do 20 reps.
Circle Walk – Assume a push-up position. From here your feet will act as the center of a circle. Start by walking to the right using your hands while your toes stay at the center of the circle. After going all the way around once, reverse and do a complete walking circle the other direction. 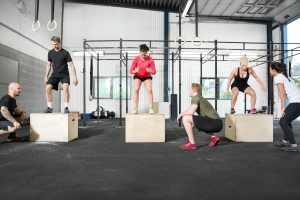 Box Hops – You need a 1 foot plyo box or cardio step for this. Stand to one side of the box with your foot closet to the box on top, in the middle of it. 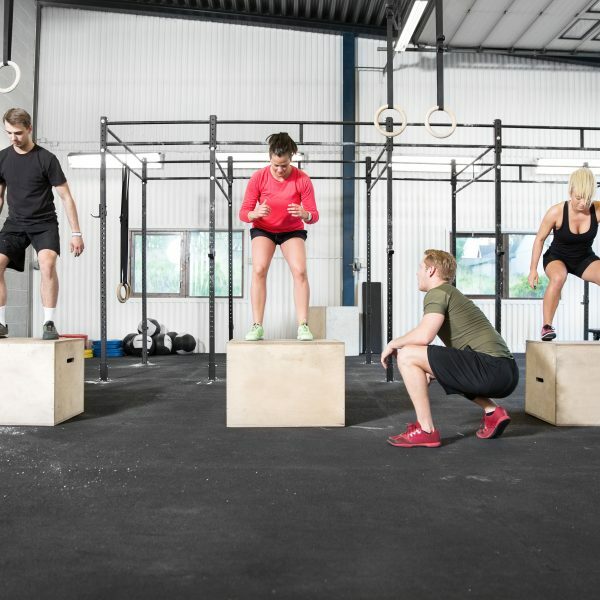 Crouch down and then leap up and over the plyo box landing on the other side but now with the other foot in the middle of the box. Immediately crouch down and leap back over to land in the starting spot to complete 1 rep. Do 10 reps total. That is it. These 4 exercises might not seem like much on paper but in practical application this is a harder workout, especially when you get older. But if you do it a few times a week soon it will be a walk in the park and you will be ready for something harder.